So the way they translate Today show in Chinese is ä»Šæ—¥, which is literally “Today.” They have imported a massive operation over from New York (though only eight of their 50+ producers). 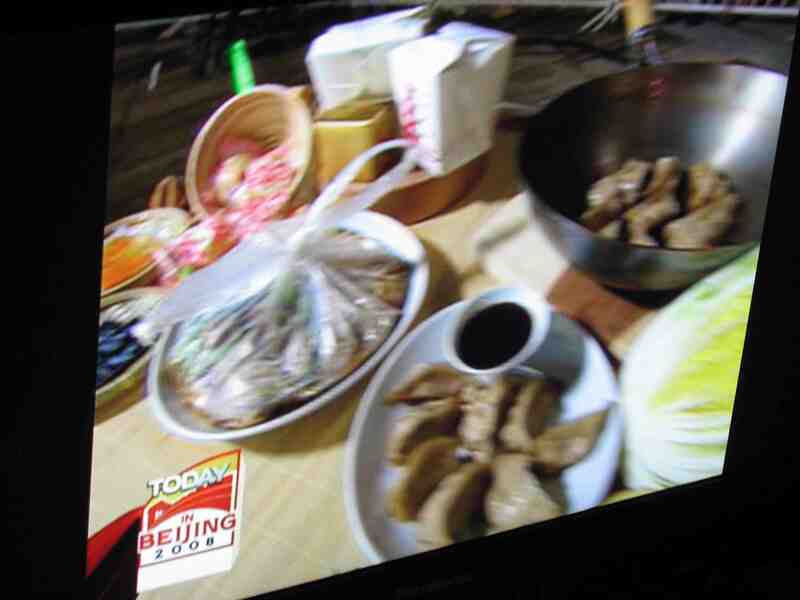 The segment, produced by Cecilia Fang, was supposed to be a bit of a cooking demonstration. But then it rained tonight in Beijing, which meant that we would all be electrocuted since the segments are done outdoors, on electric stoves. So we had to precook all the dumplings in the canteen (which has coveted peanut butter and a panini machine, but no sink). It was quite impressive that we cobbled together an induction stove and cutting board together. I usually make my dumplings with ground turkey — because that’s what they have in American supermarkets. But here we had to use pork, because turkey is a very new world bird. Because this was television, I had to spend all this time preselecting “photogenic dumplings” for the set designer. All the rejects got eaten by the staff. Because they film inside the Olympic green (where the Birds Nest and the aquatic cube are), it involved getting credentialed and getting all our props screened 48 hours ahead of time.